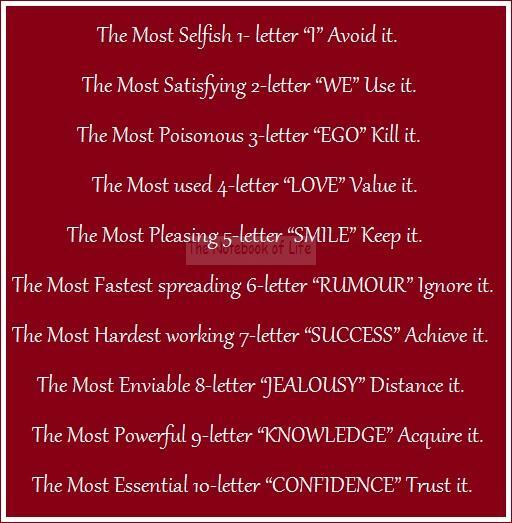 The Most Selfish 1- letter “I” Avoid it. The Most Satisfying 2-letter “WE” Use it. The Most Poisonous 3-letter “EGO” Kill it. The Most used 4-letter “LOVE” Value it. The Most Pleasing 5-letter “SMILE” Keep it. The Most Fastest spreading 6-letter “RUMOUR” Ignore it. The Most Hardest working 7-letter “SUCCESS” Achieve it. The Most Enviable 8-letter “JEALOUSY” Distance it. The Most Powerful 9-letter “KNOWLEDGE” Acquire it. The Most Essential 10-letter “CONFIDENCE” Trust it.